Tabula Mundi, In Minima the pocket size edition! Same holographic backs as the full size! Signed and numbered edition of M.
Picture shows size in comparison to full size. Pocket size decks are 83x55 mm. They come in a heavy duty satin lined box, and with a suede-like fabric bag that the box slips into. 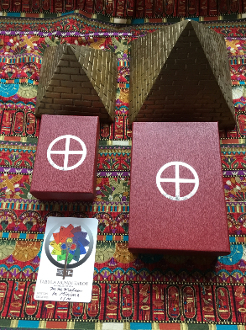 Extra Babalon Lust card is available.